AMES, Iowa — Two Iowa State University scientists and a U.S. Department of Agriculture research partner have received a national honor for their roles in a multistate research collaboration finding solutions to water quality challenges related to agricultural drainage. The award was presented Nov. 11 at the 131st annual meeting of the Association of Public Land Grant Universities (APLU) in New Orleans. The NCERA-217 committee involves researchers and extension specialists from 13 states, with representation also from the USDA Agricultural Research Service. Representing Iowa State on the team are Rameshwar Kanwar, a Charles F. Curtiss Distinguished Professor in Agriculture and Life Sciences and professor of agricultural and biosystems engineering, who has served as the committee’s advisor since the project began in 2005, Matt Helmers, professor of agricultural and biosystems engineering, extension agricultural engineer and director of the Iowa Nutrient Research Center; and Dan Jaynes, a soil scientist with the USDA Agricultural Research Service and affiliate professor of agronomy, who helped found the multistate committee. Drainage is important to agriculture in the Midwest, where excess moisture on crop fields can threaten crop production. Extensive drainage networks have been in place for a century to boost crop yields and reduce year-to-year variability. However, these subsurface drainage systems that remove excess water from fields often carry crop nutrients and bacteria that end up as pollutants. The team has helped develop federal USDA Natural Resource Conservation Service standards for several conservation practices, including saturated buffers, a technology that scientists at Iowa State and USDA ARS originated. A saturated buffer reroutes drainage tiles so water enters a vegetated streamside area where plants and soil microorganisms treat and reduce nitrates before it reaches the waterway. The team has won two awards for multistate extension publications. The most recent, “Questions and Answers about Saturated Buffers for the Midwest,” was co-authored by Jaynes, Tom Isenhart, professor of natural resource ecology and management at Iowa State, Chris Hay, senior environmental scientist at the Iowa Soybean Association, and other researchers. The group meets annually and has organized educational symposia and field days. Related collaborative efforts include the Transforming Drainage Project, an effort aimed at assessing and developing new water storage practices and technologies for drained agricultural landscapes. More information on the impacts of NCERA-217’s Multistate Research Committee is at https://www.nimss.org/projects/16216. The 2018 national and regional multistate research awards are the latest such honors recognizing Iowa State scientists for multistate agricultural research. In 2014, a similar honor went to scientists working on a project to help farmers use microirrigation systems to more sustainably irrigate their land. In 2013, a north-central region multistate research group won a regional award for work to improve swine nutrition. In 2012, a national honor was given to a team working to increase knowledge and management of soybean rust disease. 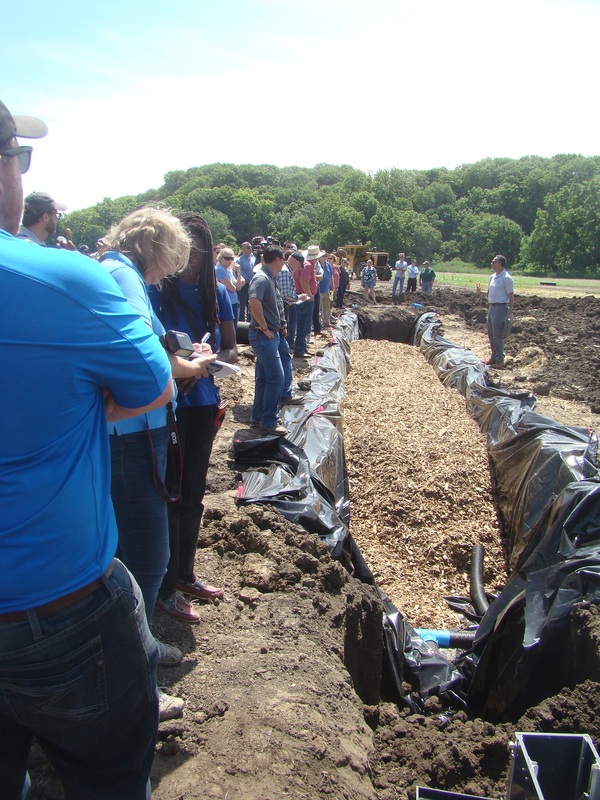 Group views a denitrification bioreactor installation at an NCERA-217 field day. Photo by Elaine Stone, Illinois Farm Bureau.